Does she like to rebel? Don't let her just talk the talk, give her the convincing look to back in up when she goes in this Star Wars Jyn Erso costume for girls! With this costume straight from 2016's The Force Awakens, she'll be ready to take on the worst that the Empire can throw at her. This polyester jumpsuit costume has all the details that will transform her into the newest heroine from a galaxy far, far away! 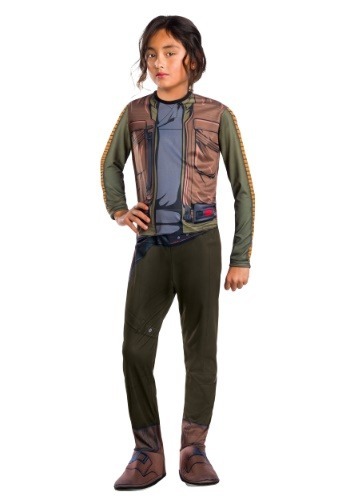 The suit features a sublimated 360 degree print, and features all of Jyn's signature costume details in one easy-to-wear design. Any girl will simply have to slip this suit on and with the character details and attached bootcovers, she'll instantly transform into character. She can team up with her friends to form the ultimate Star Wars group theme, or just go on a solo mission. Whether it's going to be a mission to take on the Empire or just secure all the neighborhood candy will be up to her, but with this officially licensed look, we're sure she'll be up for the task!